Royal Caribbean continues to lead in so many ways in mainstream cruising, with a truly winning formula down right. The arrival of Symphony of the Seas to her Miami winter home-port gives the company 25 ships, each of which delivers solidly on all promises made. When we sailed Symphony of the Seas last fall, we saw that the focus is very much about families, fun (mostly via theme park slides and water parks) and, most emphatically, entertainment. Perfect Day at Coco Cay offers a whole new take on the private island experience. 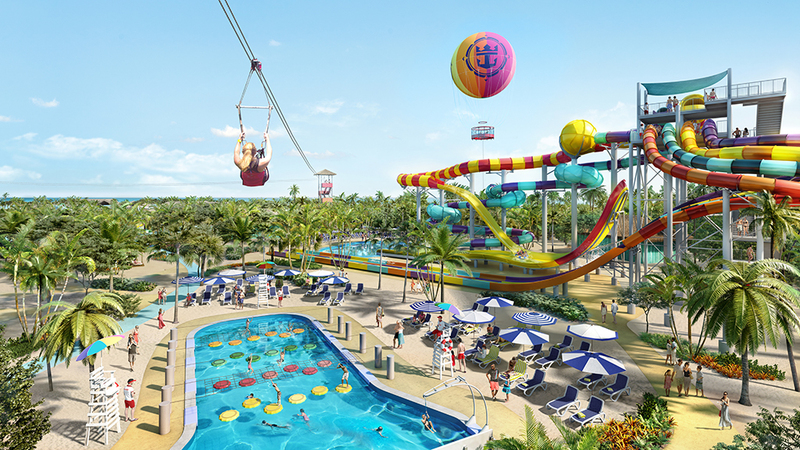 With their private island, Coco Cay undergoing a major renovation and gathering steam for a grand unveiling in May 2019, the Perfect Day at Coco Cay Island Experience will be exhilarating to say the least! A great spot for everyone – whether to chill and relax or be on the go all day – Coco Cay will offer the ultimate Perfect Day. This ship offers a wealth of highlights beginning with the very good food served, with a great deal of care and attention, in 20 different venues (nine of which are complimentary) with more than 300 menu choices overall. We loved Chops Grille, Jamie’s Italian and thought Wonderland was more than spectacular. The décor alone is worth the price of admission and now with a two-storey restaurant and a view out to Boardwalk, this is an amazing venue. Like a well-oiled machine, Symphony dazzles with great service and a diligent and competent staff – Royal Caribbean has perfected everything they deliver and for this, they must be applauded. What’s new about this fourth-in-class ship? It’s almost “old news” to discuss the seven neighbourhoods on board that debuted just 10 years ago on the first ship in this class – Oasis of the Seas. We know and love Central Park, the Boardwalk, the Royal Promenade, the Carousel, Rising Tide Bar, the resort pools, the AquaTheater and the various other offerings on board. They’re great, but… well… we’re used to them. After all, Symphony is the fourth ship in this series. We wondered, how does Royal Caribbean keep on keeping on? How do they continue to raise the bar and provide one of the best vacations possible – and not just at sea? Royal Caribbean’s secret is to push boundaries and never cease to create. The large variety of entertainment offered on a seven-day cruise is testament to this. You’ll experience at least four marquee shows, each of which comes with pent-up demand, a sense of marvel and the kind of great promise that has guests saying to each other, “You must see that show!”, “This one is fabulous!” and “You can’t miss HiRO!” And those guests will be absolutely right! We saw Flight…Dare To Dream in the Royal Theater and enjoyed a performance so stunning one could barely have imagined it could take place on Broadway, never mind on a ship. It was remarkable, powerful, emotional, SRO-worthy and more. With a big cast (the same one that performed in Hairspray the night before – yes Hairspray is on the main stage, too) this show was all about space flight, the moon landing, the Space Station and moving backwards a hundred years. 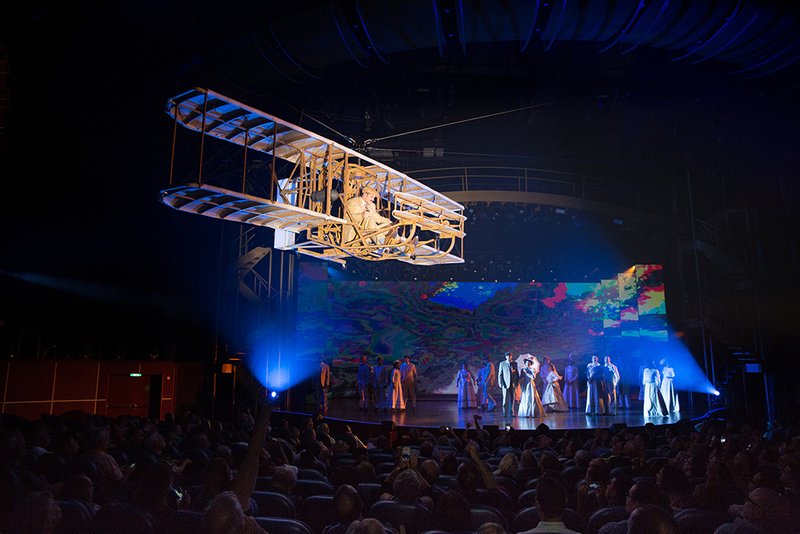 The grand finale that took us back to the Wright Brothers and the first manned flight and the staging, props, costumes, songs and performers were all exceptional. The AquaTheater, on the aft deck of Boardwalk has been a longstanding favourite – a showcase at sea performed under the light of a silvery moon. HiRO, a Japanese themed show full of acrobats, highwire walkers, extreme athletes, divers and high-flying feats is hard to describe but suffice to say that it offers non-stop, in-your-face, heart-pounding moments, featuring talented performers in a performance that is intriguing, powerful and immensely entertaining. In the last three years, since a new VP of Entertainment was hired at Royal Caribbean, the change in the creativity and delivery of the onboard shows is palpable. What you see is mind-boggling – Vegas-worthy, if you will. The ice rink was the venue for 1977 – A Thrilling Adventure On Ice – a whimsical, fantasy of time travel mixed in with the theft of valuable jewels from the Tower of London. The talented ice skaters’ performances were impeccable – and there were many surprises that blew the audience’s combined mind. Costumes were stunning and the special effects – with 48 tiny drones literally “dancing” in unison to open the show – were fascinating. Then through the power of technology, the ice surface literally became an ocean, with penguins diving and a humpback whale appearing and slowly swimming through the rink. Amazing! 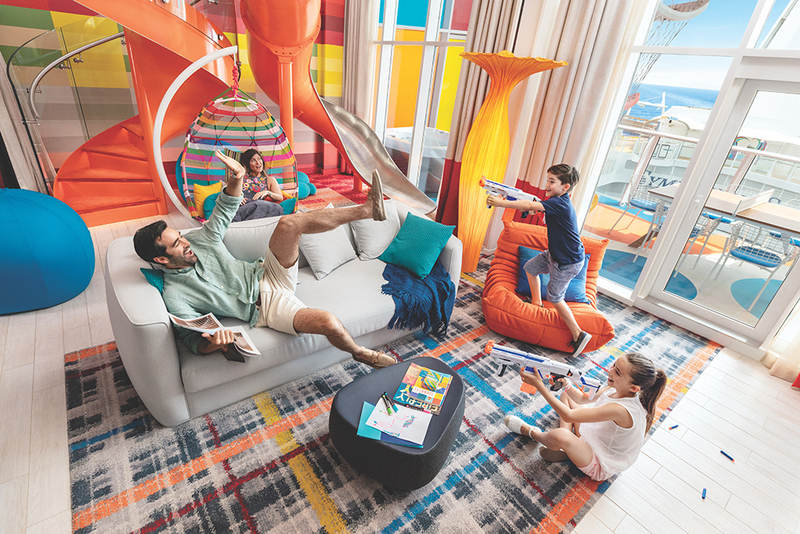 What really stands out with Symphony of the Seas, however, is that Royal Caribbean is now firmly ensconced as a family cruise line – there’s so much for every generation, from kids to grandparents. The ultimate Family Suite, which is not inexpensive, is sold out for months in advance and other spacious family-oriented suites and staterooms are also exceedingly popular. We loved the four-bedroom, four-bathroom villa suite – gorgeous and perfect for eight adults or a larger family. These accommodations come with an included beverage package, the services of a Royal Genie (think concierge-come-butler) and more, and are in Suite Class, offering access to their own private restaurant – the lovely Coastal Kitchen. 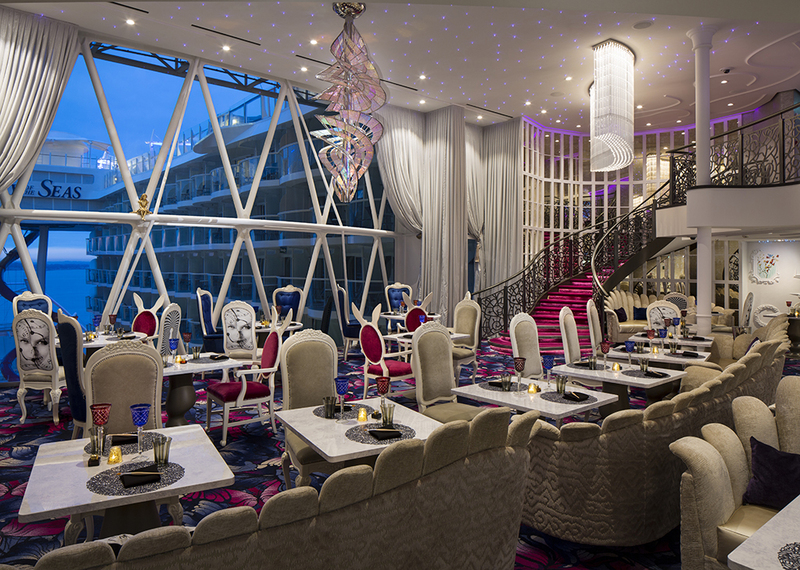 With such an array of restaurant choices, ranging from the superb 150 Central Park to casual burgers at Johnny Rockets, it’s always good to see Royal Caribbean add a few new spots. We had yummy guacamole and a margarita at El Loco Fresh the new casual Mexican venue and dove into Hooked, on the upper level of the Solarium – also casual and great for seafood lovers. Other dining choices include Japanese at Izumi, pizza at Sorrento’s, a sports bar and pub fare. And now more about Perfect Day at Coco Cay – emerging in May with a whole new take on a private island port in those crystalline Bahamian waters. There will be an incredible line-up of experiences to satisfy everyone including the tallest waterslide in North America, the largest wave pool in the Caribbean, overwater cabanas at the exclusive Coco Beach Club, a swim-up bar, buckets of fun at Splashaway Bay for the little ones and a bird’s eye view of your surroundings from a tethered helium balloon rising 450 feet above the sand. Perfect Day at Coco Cay will offer the ultimate combo of thrill and chill, along with casual restaurants and bars scattered throughout paradise. Naturally, there will be plenty of watersports, as well as a get-away-from-it-all beach for those who just want to relax. Symphony of the Seas delivers in the most spectacular fashion. There really is something for everyone and Royal Caribbean continues to offer their unique take on remarkable cruise vacations to some of the most marvellous places in our world. IF YOU GO: Your travel advisor can help you find the right itinerary and accommodation for your Royal Caribbean cruise or check out www.royalcaribbean.com. Written by Vanessa Lee. Originally published in Cruise and Travel Lifestyles, Winter/Spring 2019 edition. All photos courtesy of Royal Caribbean.